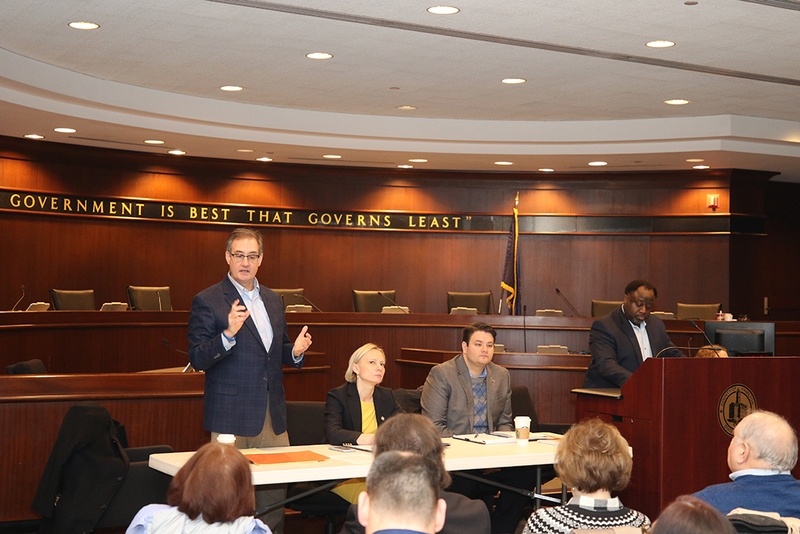 Hamilton County lawmakers recently took time to hold a public town hall meeting Jan. 26 at the Hamilton County Government and Judicial Center in Noblesville to discuss issues in the current legislative session. State Sens. J.D. Ford (D-Indianapolis), John Ruckleshaus (R-Indianapolis), Victoria Spartz (R-Noblesville) and State Reps. Tony Cook (R-Cicero) and Donna Schaibley (R-Carmel) took part. Moderated by local attorney and government commentator Abdul-Hakim Shabazz, topics ranged from teacher pay to school safety to medical marijuana. But the one topic that took up most of the discussion time was proposed hate crime legislation. Speaking directly to Cook, who has authored a hate crime bill introduced to this year’s General Assembly, Shabazz asked for additional detail. Cook’s bill would implement terms for sentence enhancements, whereby a person must first be convicted of the crime associated with the hate crime, and also outlines what qualifies as a hate crime. “When the sentencing comes, that’s when the prosecutor can argue for an enhancement to the sentencing. Since the (U.S.) Supreme Court ruled on (hate crimes) in 1993, they established protected classes and categories – race, gender, religion, age – the types of things we all have,” Cook said. “People will argue that it’s just unlimited, but you know some of the states that have it, like Wisconsin, have had it since the 1980s. So, what (I) did was glean out the best (categories) that have stood the test of time. My bill has 13, including all the ones in the Civil Rights Act, but it also adds sexual orientation, sexual identity, (military and law enforcement). I tried to take it and base it on FBI data, the number of incidents we were seeing in Indiana. The top three were race, sexual orientation/identity and religion. The 13 “identifiers” laid out in Cook’s bill are age, race, religion, ethnicity, national origin, ancestry, color, gender, gender identity, sexual orientation, disability, status as a police officer or service in the U.S. armed forces. Schaibley, speaking after Cook, said she is “absolutely behind” the bill. 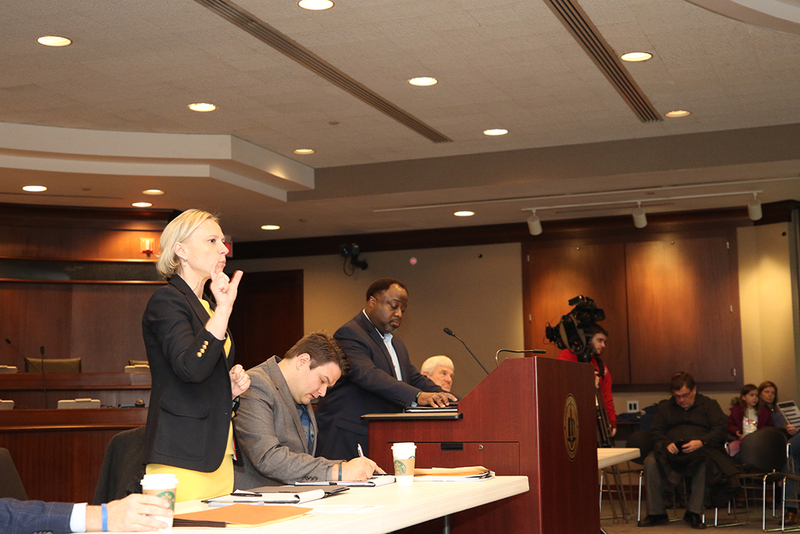 Schaibley also spoke on how the state’s lack of hate crime legislation is potentially hurting the state’s economy and business communities. Ford, the lone Democrat participant, agreed with Cook and Schaibley. Spartz voice disapproval or support of Cook’s proposed bill, but rather discussed her frustration with the time spent debating the issue with no resolution. Rucklehaus said he believes the legislature wants to make a statement about where it stands.